Rachel Kernodle posts a clever illustration of inverse functions. Then I asked our esteemed volunteer to use one breath to blow up the first balloon. Taped it up. Again, for two breaths. Taped. Et cetera until we got a total of six balloons taped. 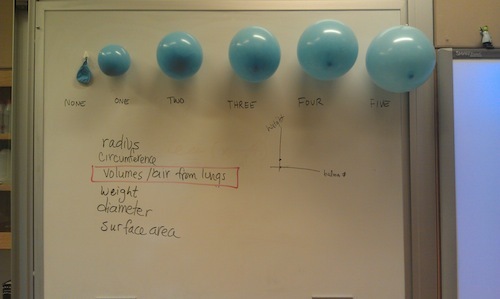 Then I asked what things are measurable in the balloons. Bam. List. So, how were we going to measure the height of a class? Well, the kids came up with three suggestions. I was walking with my wife along the River Corrib in Galway last weekend when we got into an argument that lasted the rest of the walk. I’ll present our two arguments and some illustrative video. Then I’d like you or your students to help sort us out. Argument A: It would be much harder to swim to the other side of the river in the fast-moving water as in still water. Argument B: It would be just as easy to swim to the other side of the river in the fast-moving water as in still water. I hope this gets as out of hand for you and your students as it did for me and my wife. This excellent question exhibits a quality that is not found often in math curricula: it has the “specificity sweet spot”: it is specific enough for a student to answer, but non-specific enough for every kid to agree on the answer. Students making different assumptions will have different responses, thus creating a real mathematical argument. I ran across Nora Oswald’s Super Mario Bros. first act on 101questions and was instantly charmed. It puts its head down and does what my favorite first acts do: establish a context quickly, then leave a loose end hanging. The model wasn’t what they expected. 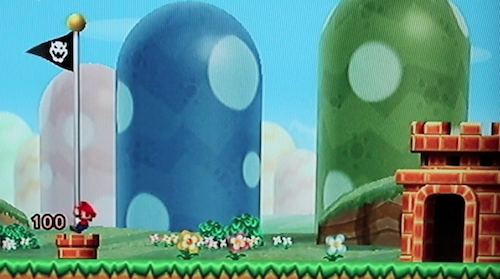 Oswald locates a similar flagpole model on a fan wiki. It wouldn’t be the worst idea at all to have students graph that relationship (step function!) and compare it to the incorrect linear model they anticipated. We watch the third act (the answer). Once we are getting close to the third jump, the students are hooked, their eyes are glued to the screen, and one students rubs his palms together and says, “Here we go!”. When they see that the answer is 400, one student stands up, throws his pencil down, and complains that he was so close. One of my students (who hardly says boo in class) threw his pencil down when he saw the third act. If that isn’t passion, I don’t know what is. They were in to it, they wanted to know why, they asked where those numbers came from, they made guesses, they tried to figure out why, they took pictures of the board before leaving class. One student even said that he was going to post about this on some gaming forum. Me: Now … the strange thing about this elephant parade is that each elephant is a bit smaller than the one in front of it, and each one has an additional leg. Griffin: How many legs does the last one have? Let’s pause for a moment. This was his question, not mine. Real world be damned, this is a habit of mind thing. Have I been focusing too much on applying mathematics and expanding the concept of “relevance?” Have I been expending too much energy on looking for relevance when I should play off of the interesting and awesome world that is mathematics? I had one student who became more disengaged throughout the year as everyone else was loving the relevance and exploring their own questions. These are important posts. They remind me that it’s a flawed theory of student engagement that leads you to draw two circles, one labeled “real” and the other “fake,” and put material into either one with any kind of objective confidence. Seven-legged elephants are real to Griffin. Numbers are real to Jimmy Pai’s student. Star Wars isn’t real, but for millions of viewers, it feels real. The techniques of storytelling can make the unreal seem real, but let’s all agree to bear in mind that what’s real to one student isn’t necessarily real to another. Last June, Stanford history education professor Sam Wineburg went to Umeå University in Sweden to accept an honorary doctorate. He had prepared remarks on his recent Howard Zinn critique [pdf] but instead chose to analyze his complicated sense of relevance in the age of Twitter. It’s fascinating introspection on what counts as scholarship, how status is awarded, and how we define academic relevance in the 21st century. It’s particularly interesting given that he’s a tenured professor at an elite university. He’s throwing stones from inside the glass house, basically. On a personal level, having felt forced to maintain something of a firewall between my Internet advocacy and my work at Stanford, it was cathartic to hear that one of my professors isn’t just aware of Twitter but understands that it complicates and enriches his professional existence. After I received tenure … I had an opportunity to reflect upon the way that my own values had become changed by the culture of the university in which I was rewarded for publishing in the most prestigious journals, whether or not those journals had any effect on anyone else except for the small number of people reading those journals. Our theory of change is that we will produce materials that are better than those that are commercially bought and the commercial companies will start to see that people are downloading our materials for free and they will start to copy what we are doing and imitate what we are doing. Our worry is that, as we continue to produce only our refereed journal articles, we are not understanding the profound changes in how information is disseminated in modern society. The university, particularly professional schools that are supposed to be producing knowledge for practitioners, are being left behind. We are becoming less and less relevant to the people who most need our knowledge — teachers and students and principals and decisionmakers in the field. He’s on Twitter. I’ll encourage him (and anyone else feeling his angst) to look to Jon Becker, Cedar Riener, Sara Goldrick-Rab, and Bruce Baker as academics doing interesting advocacy on Twitter. 2013 Feb 19. Here is another disclosure from Prof. Wineburg, a brief interview on his struggle with depression.